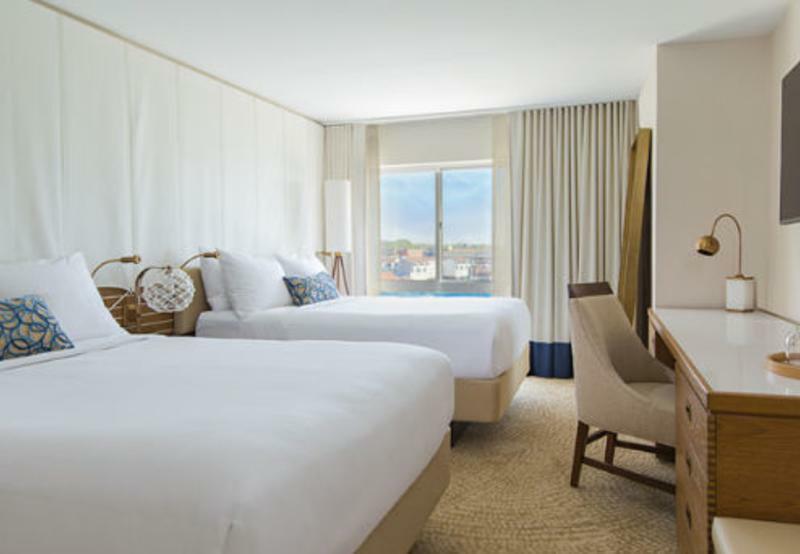 Last month, an entirely re-imagined Newport Marriott revealed its $35 million renovation. Located in the heart of this culture-rich, seaside destination, the transformation included all 320 rooms and suites, common areas and function spaces. FOR MEETING DELEGATES: The largest hotel in the city, the Newport Marriott provides over 24,400 square feet of flexible meeting space including 16 meeting rooms plus the 7,600 square-foot Grand Ballroom. Tech support includes wired and wireless high-speed Internet access, a full complement of audio-visual equipment, a private video conferencing unit, and the Marriott Hotels Red Coat Direct meeting services app. In addition, theres a brand in M Club lounge onsite, complimentary for Gold and Platinum Marriott Rewards members or available for guest upgrade. FOR ALL TRAVELERS: As guests enter the hotel, a chandelier sparkles like sunlight on water. The new Marriott Greatroom lobby is a lively and inviting place for guests to work, socialize and relax in a setting that feels decidedly coastal - a concentric rope garden creates an intimate seating area while water features lend sound and light to the airy atrium. In the guestrooms, a seaside color palette of cloud whites, soft sands and ocean blues is a relaxing welcome that leads to the striking focal point - a remarkable backlit sail that stretches the entire length of the boat decking-inspired headboard wall. Furnishings are precisely crafted, with the best metals and leather finishes, evoking the environs of a fine yacht. Completely connected yet discreetly wired, the rooms have all the technology must-haves from bedside outlets and USB ports to Wi-Fi and 55 wall-mounted HDTVs. GATHERING & DINING: A new restaurant, Mainsail, and two bars provide a perfect perch for enjoying the Newport scene. The 98-seat restaurant serves a dock-to-table local seafood menu and gives guests a front row harbor view in floor-to-ceiling windows. 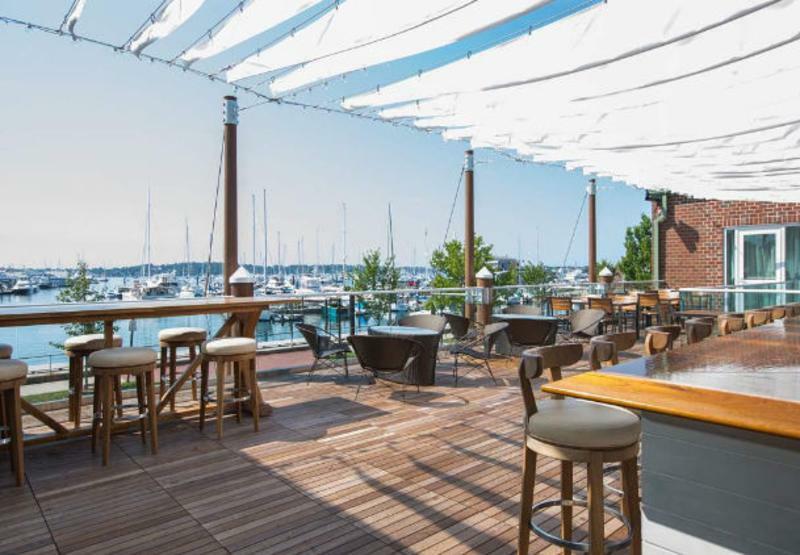 Creative yet familiar small plates are available at two bars: a 58-seat restaurant bar, The Skiff, with spectacular water views that extends to a 57-seat new outdoor bar terrace (which will open in late May) overlooking the yachts and sailboats in Newport Harbor. 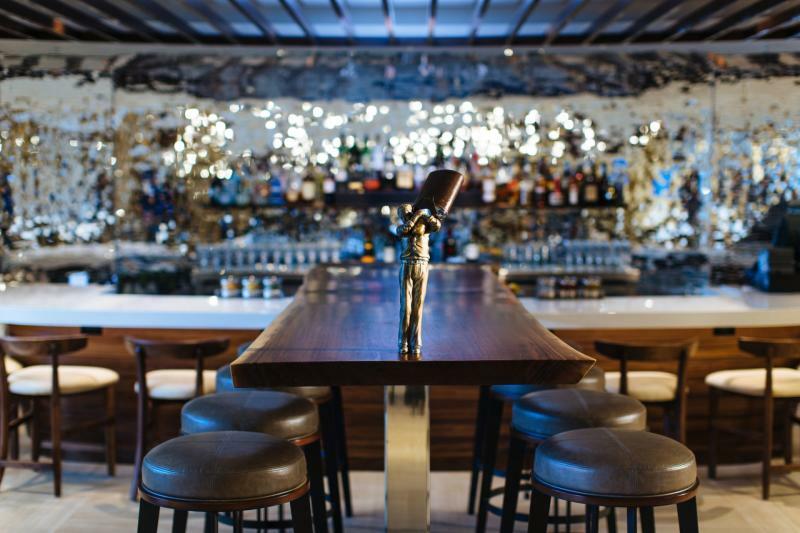 A second bar in the lobby, The Plank, will include a sculptural reference to those prohibition-era Rhode Islanders who went to extreme lengths to enjoy their libations. 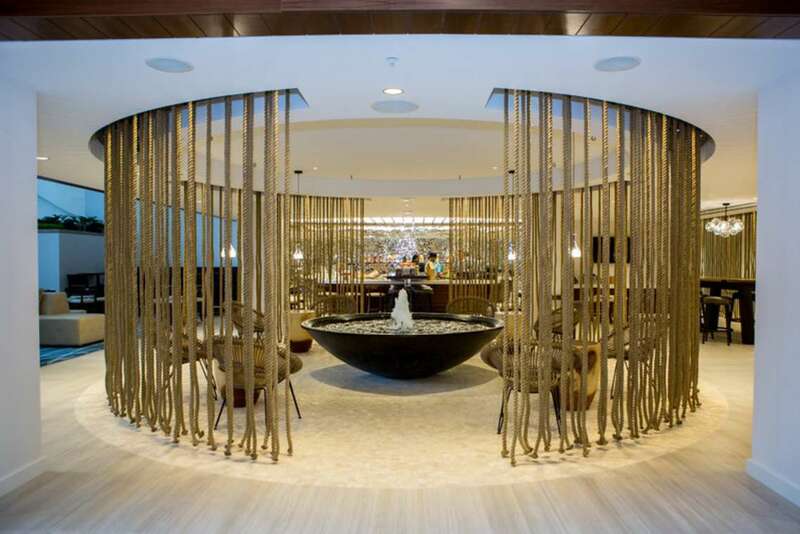 R&R: The 4,500-square-foot Spa at Newport Marriott, which opened in 2009, is the largest in Newport. It offers eight treatment rooms, a private relaxation lounge, as well as a hair and nail salon. Also available is a 10,000 square foot health club, with indoor saline swimming pool, sauna, whirlpool, racquetball courts, state-of-the-art fitness room and seasonal roof deck.